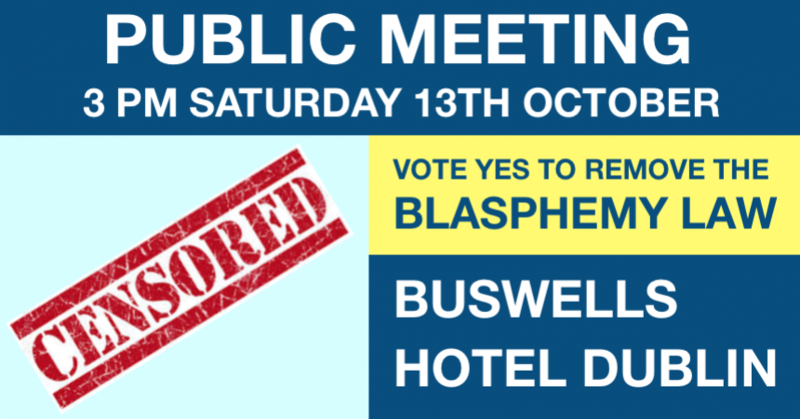 The Irish Constitution, written in 1937, makes blasphemy an offence punishable by law. there will be a referendum on 26 October (along with the Presidential election) in which we can vote to repeal this anachronistic offence. We support the right to freedom of religion or belief, the right to freedom of speech, and the separation of church and State. the Irish blasphemy law infringes all of these principles. It has no place in a modern democratic republic. Our blasphemy law is harmful. In Ireland, it has cause media outlets to self-censor themselves. Globally, it has emboldened States with more authoritarian blasphemy laws, who have cited the Irish law at the UN to support theirs. Find this event on meetup and facebook.